This is so clever and simple! Now I know what to make my aunts for stocking-stuffers! Very cute, Alison! Also a wonderful idea! :D Thank you! This is so adorable! This one I really think I'm gonna do! Just as soon as I get some felt. these will be cute to give w/Valentines for my girls' class! Is there a template for these? They would have to be just the right size to fit, I would think. 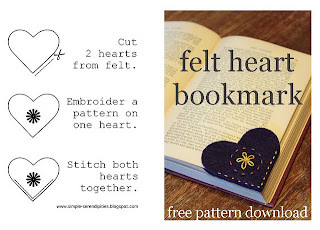 Stephanie, I made a printable pattern for the bookmarks and will try to post it this week. Thanks for visiting! can you just do it with needle and thread or use a sewing machine? And did you use regular thread because it looks a little thicker. I sewed them by hand (thread & needle) and used 3 strands of embroidery floss. Alison, were you able to post the printable pattern? Thanks!!! 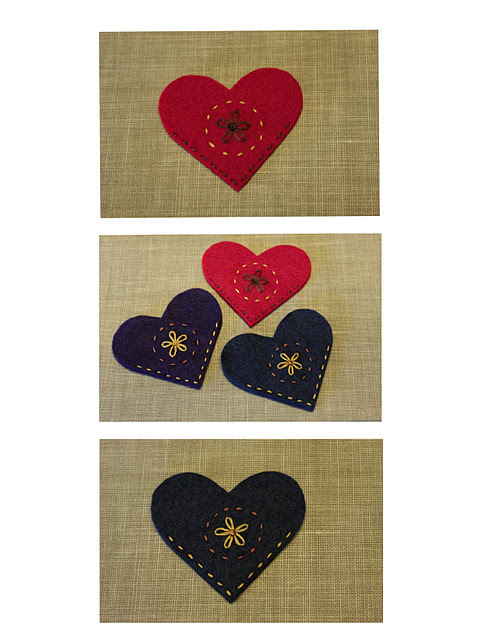 Hi, just wanted to let you know these gorgeous felt heart bookmarks will be featured at this week's Fabulous Finds Fridays at Practical Scrappers. I was looking for a simple gift to give my teachers as a thank you during National School Counselor Week. This will be perfect. Thank you! Love this idea...my 2nd grade daughter and I are going to make these for her class for Valentine's Day. Totally off topic, but the background on your blog looks exactly like the wallpaper I had in my room when I was a little girl. LOVE IT! How gorjuss they are !!! This is a great beginner sewing project for my Girl Scout Troops, they can make two or more, keeping one and giving others as gifts. I like for my Scouts to make useful crafts, if we can recycle materials that is great too. Also thinking great to make and give away at Assist living home we voluneeter at for Valentines day since alot of the residents can't eat "sweets" but they like to read. Thank you for the idea. Love this!! !Will definitely try it! I'm going to make these for my church Bazar next week, just bought the supplies today! These are really cute. Definitely will be making some in the new year. I'd love to feature your project on CraftFoxes.com. May I have permission to feature one photo and a project description, with a link back to your site for the full tutorial? Adorable bookmark! Lindsay, absolutely! Thanks for asking! :) I'm glad you like the bookmark. Sorry it took me so long to respond. I just now found your comment. Love This! I am definitely going to do this. 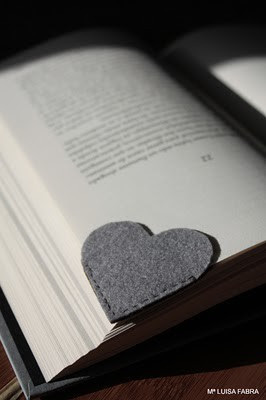 I love felt, love hearts, love books. These are quite lovely. Thanks for sharing the how-to. Found your blog thru Pinterest - added this to my Gifts for Booklovers board. I think i'll steal it! Alison, can you please show me the template? Such a great idea! Simple and sweet. I'm sure I will be making several for Christmas this year. Found you via Pinterest... thank you for sharing! A lovely idea. Just what I was looking for. I will be making for my class of first graders.